Thanksgiving is coming up for us Americans next week, which is always tasty. In my family at least, we cook up a storm! And after that the holiday season commences when we’re celebrating with friends and family, eating out more, and definitely indulging. 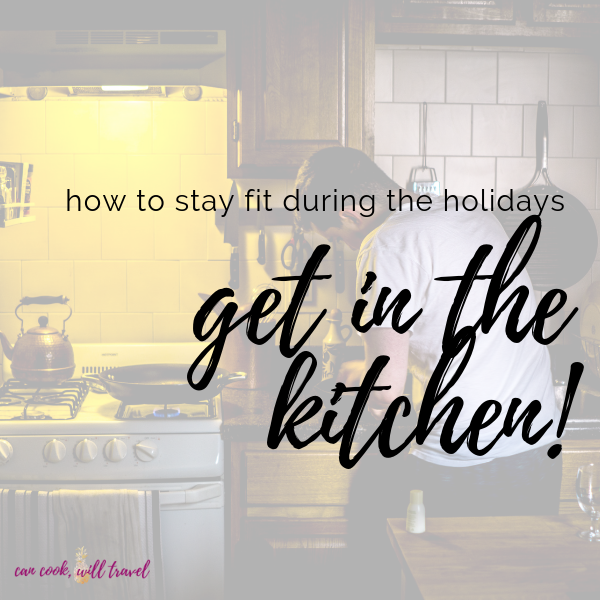 But one thing that’s been on my mind is how to stay fit during the holidays. I usually eat pretty well, but in the past few months I’ve gotten a bit off track. So I’ve committed myself to trying to lose a few pounds by the end of the year. I’ve also made a bet with my boyfriend to see who could get closer to their goal weight. 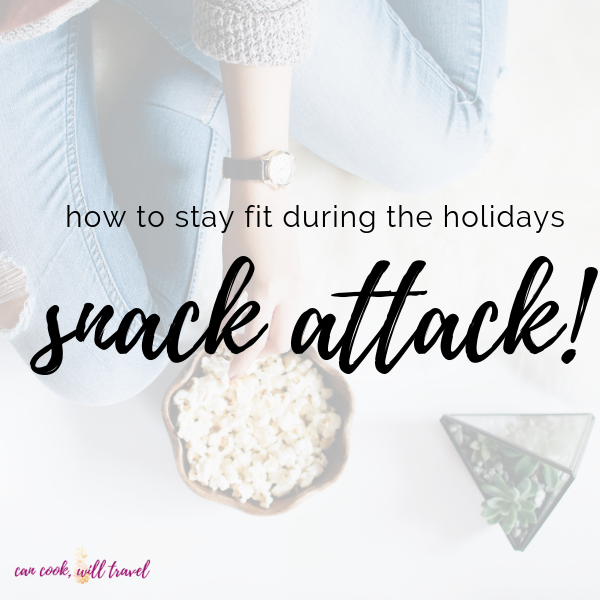 Because a little healthy competition doesn’t hurt at all when I’m trying to figure out how to stay fit during the holidays. So this looks like eating pretty healthy, not drinking as much, and definitely staying active. My favorite way to stay active is to walk outside, but in the past few days it’s been increasingly chilly in KC. Although I think it’s going to warm up soon, so that’s awesome! I’ve had to get out of my comfort zone a bit and start using the treadmill in my fitness center. I hate working out in front of people, but sometimes you just have to. And surprisingly I’ve been (almost) enjoying myself, so that is definitely boding well in these chilly months. 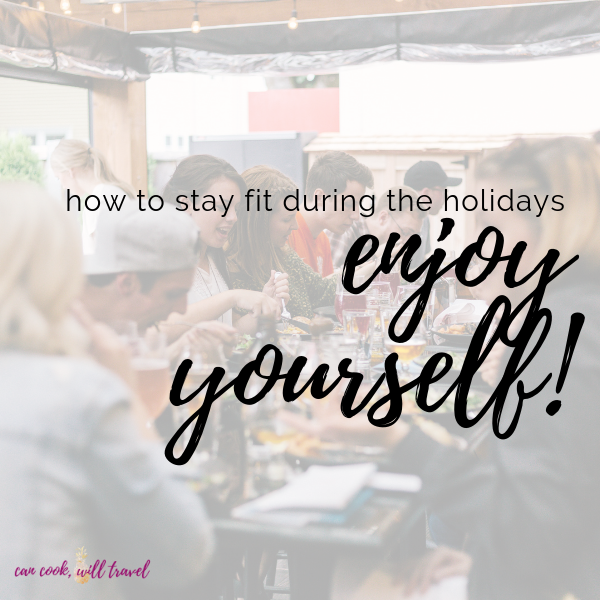 So I’ve started really thinking about the whole idea around how to stay fit during the holidays. 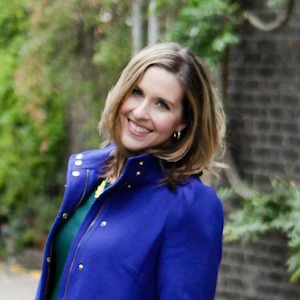 I know I’m not the only person who has this on my mind, so I’m sharing my best tips that I’ll absolutely use too. 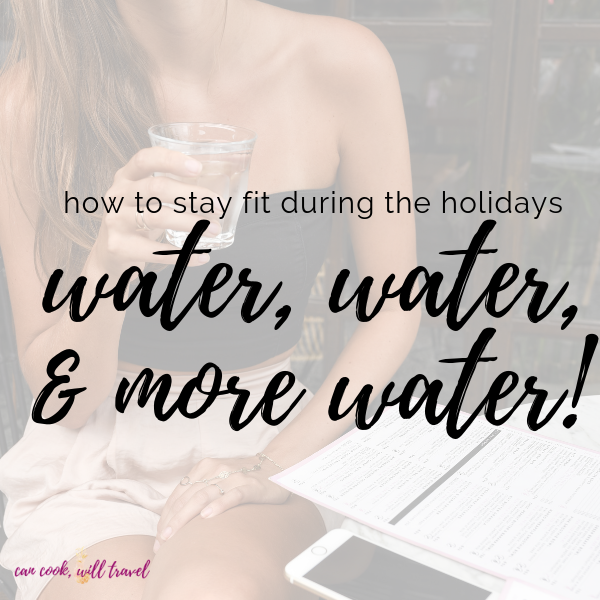 Let’s dive into how to stay fit during the holidays with these tips! I’ve been working lately to lose weight BEFORE the holidays begin, because I know that there will be times I don’t eat perfectly. So my thought is to get as close as I can before they start in order to maintain a bit. 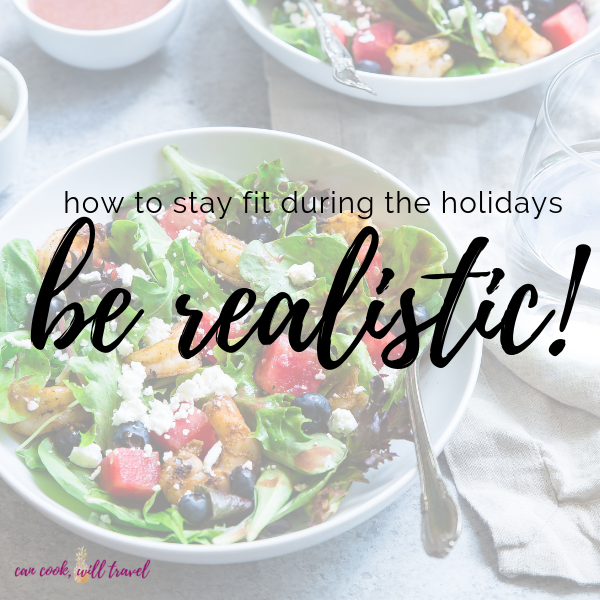 I’m trying to be realistic when it comes to how to stay fit during the holidays, so I’m not expecting major results during that time. What I’d love to do is maybe lose 2-3 pounds between Thanksgiving and Christmas and work hard to stay around there as I can. The fact is that I know I don’t need to lose a ton of weight, but these tips apply no matter where you’re at. If you can make small steps now, then why not do that?! So I recommend using these tips even when it’s not the holidays too! That means don’t expect to lose a ton of weight during this time, because then you’re going to feel deprived. Or even worse, you’ll fail and potentially stop trying. So stay realistic and give yourself room to enjoy the holiday. We all know that water is uber important to feeling and looking great. Did you know that we’re actually 50-65% water in our bodies? Depending upon your age and physique, you’ll have more or less water throughout, but isn’t that incredible?! So you want to stay hydrated so you have tons of energy, great skin, and good digestion. I like to aim for half of my body weight (at least) in ounces of water a day. So if you weigh 200 pounds, you need about 100 ounces of water, so start drinking! If you know you’re off to a party that night, then try to get your water intake in early. If you don’t love water, figure out a way to enjoy it more. Maybe it’s in adding fruit or citrus to your water, drinking it in a cup you love, adding essential oils (ones you can ingest), etc. My favorite thing to do is to drink 2 glasses of water before I eat anything in a day, so that I can get off to a rocking start. So I’ll brush my teeth and drink a big glass (about 17 ounces) or water, and then drink another before breakfast. One key is to stay consistent with your water glass so you know how much you’re drinking. So I like to pour my glass with water and then measure it to see about how many ounces it holds. My glass I’ve used lately holds about 17 ounces, so I use that as my guideline to know how much to drink throughout the day. And then keep track of each glass you drink! Now when I leave town around the holidays, it’s often to see my family. So I’m gone for several days, which means lots of hours of me not cooking and eating like I normally do. One area that can be a problem is in the snacking realm, because I love to snack! If I travel with people who aren’t as health conscious, then I find myself surrounded by unhealthy foods. So I try to bring food with me. That might include some dried fruit, beef jerky, healthy chips, protein bars, fruit, dark chocolate, etc. The idea is to stock up and make it really easy for you to make healthy choices when you’re out of town. And you may want to pack extras in case others decide it looks good. After all, showing others how easy it can be may inspire them to eat well too! And when you see somebody snacking on chips, it may be tempting to have some too. But knowing you have a stash of healthy options can really help you make better choices. When I’m out of town, I find I’m not always in control of what we eat. But I’m always happy to lend a hand in the kitchen, which comes in handy. Sometimes you may have the option to make a dish slightly more healthy, so take advantage of that! And offer to help cook or to cook a dish or a meal if you can. That will make sure that you’re in more control over what you’re eating, and you can share that healthy food with everyone else. You could definitely arm yourself with some healthy, simple recipes in advance, so you have ideas. And even if you aren’t super comfy in the kitchen, I’ve got tons of recipes on this blog for you! Over the past couple of years I’ve made healthier recipes a priority, so I hope you find something you enjoy! This is something I’ve done since earlier this month, and it’s been really eye opening. When I track my day I’m keeping track of: weight first thing in the morning, ounces of water drank throughout the day, exercise, all meals and snacks. I’m not a giant fan of weighing myself regularly, so this is a change for me. But I jump on the scale first thing when I wake up to see my starting weight. It’s a great way to evaluate how my choices yesterday affected my body, which is kinda fun. I update my water count as I drink a glass, so that makes it easy. I’ve become very good at figuring out multiples of 17, so you’ll be working on your math skills too! When it comes to exercise, this is one area I see the biggest difference. And that makes total sense, right?! If it’s a day I’ve been too busy to work out, of course I’m probably not going to see as much improvement as if I’d hit the treadmill or the trail. I’ve also found it’s held me kinda accountable, because I like to have something to enter in this section. Oh and I totally count my morning and evening stretches when I’m able to do those. And finally, anything I eat (even if it’s 1 grape) will be tracked in my meals for the day. So having to write it all down makes your really conscious of what you eat, and it definitely makes you think twice before eating it. As you ask yourself “do I really want to write down that I ate a candy bar and 3 handfuls of kettle chips today?”. It’s so true!! If you’re curious how I track, well it’s nothing fancy. I actually just opened up a note in Evernote and use bullets for the day to track each item. It’s easy, and I can copy the previous day’s activities and use them as a template as I begin that day’s tracking. If you’re a pen and paper person, grab a cute notebook or journal and then track it all there! I mentioned above that I track my exercise, so that means staying active is key. And that’s a given, right?! We’re not going to stay fit or lose weight (whatever your goal is), without moving our bodies. And if you can do it every day, then I think you’ll be amazed by how well you progress. I can absolutely tell a difference on the days I didn’t get a walk, run, or workout in. I wake up seeing barely any change in my weight, and I go to bed not feeling as productive or great about my day. The days I jump on that treadmill or get fresh air on a long walk are the nights I go to bed feeling super accomplished. And before long, it just becomes a habit to get off your booty and move! 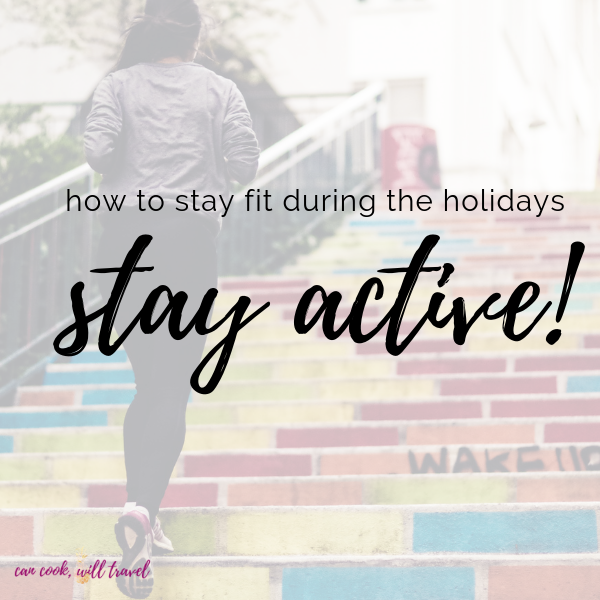 Now when it comes to how to stay fit during the holidays, staying active can definitely be a challenge if you let it. Especially if you’re out of town like I often am. So find a family member to go on a walk with, for example. My dad and I love going for walks whenever we have time to do so especially in the mornings. Plus it’s a great chance to move and catch up. Or find a sibling or cousin to do a workout program together. Or if there’s workout equipment where you’re going, then commit to yourself to fit in time to hit the treadmill, elliptical, exercise bike, etc. I know I definitely plan on hitting the treadmill when I’m visiting my parents in the coming weeks. 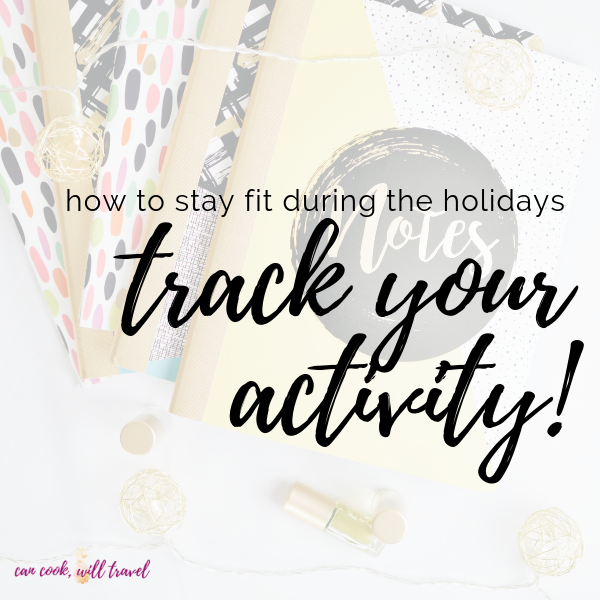 And make sure to track your progress, because when you see how staying active results in keeping extra pounds at bay, it’s pretty empowering! You guys, it’s totally okay to indulge over the holidays. Just do it in small quantities and don’t do it every single day. The key is to embrace this time of year, and enjoy yourself. Don’t beat yourself up for having a piece of pie or seconds of mashed potatoes (speaking from experience). This is the time of year to laugh and have fun. Just do it within reason. Another great way to indulge without going crazy is focusing on smaller portions and eating slowly. This is something I totally need to work on, but I used to be good at it, so I know I can again. Take smaller servings, so you eat a little of everything. Or even better is to use a smaller plate so it tricks your brain into thinking it’s a lot of food. And then savor each bite, and don’t inhale it as if the person next to you is going to eat your food! This way you’re able to enjoy your favorite foods but keep the quantities a bit lower. 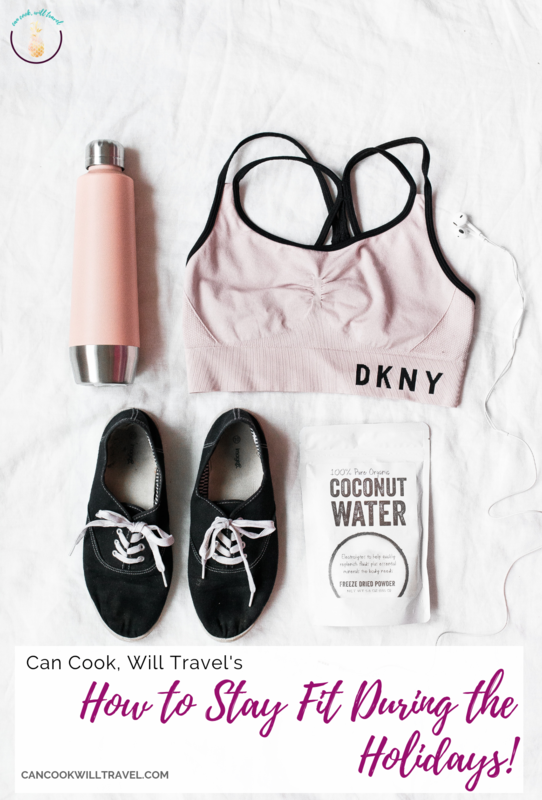 So the basic ideas here are to plan ahead both your workouts and food. I know it’s easy to over-indulge, so be aware but it’s also a bit of what this time of year is about. So try to eat smaller portions, lots of veggies, and tons of water, and then you’ll be all set! 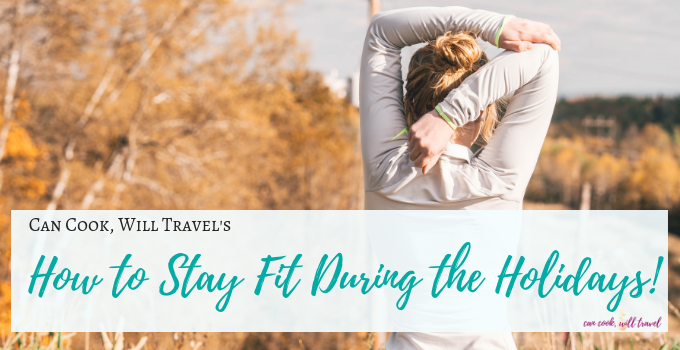 I’d love to know your best tips on how to stay fit during the holidays, so comment below! Are there certain dishes or ways to fit in an exercise that work for you? share away, so we can all do this together! Stay inspired & you’ve got this!